Summary: Includes man posed wearing headdress, woman standing with bow and arrow, and woman holding up baby in cradle carrier. Date Created/Published: c1913 April 5. Summary: Images of Ojibwa camp life, probably in Ontario, Canada. Includes men on beach of Lake of the Woods, woman standing next to tepee, a family in a canoe, a man mending a canoe, a fish drying rack in front of a tepee, a corn drying rack, and a woman in canoe in a paddy of wild rice. Summary: Portraits of Native American men and women, probably Ojibwa and Siksika (Blackfoot). 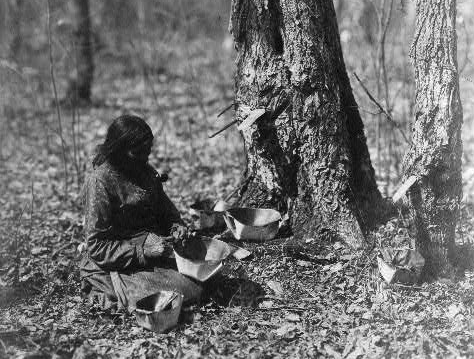 Includes images of Ojibwa woman making birchbark vessels and boiling syrup, Ojibwa man in canoe, and Siksika men in “medicine lodge” and people on horseback with travois.